LAN Airlines is trying to expand its US presence. I’ve flown the airline once — back when it was known as LAN Chile. What I found interesting is they use of “USA” in the Twitter address. 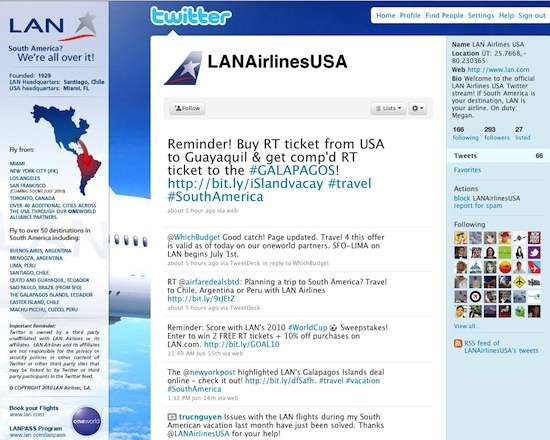 LAN had been using @LANAirlinesUS and gave it up in favor of @LANAirlinesUSA. The naming of Twitter feeds is highly inconsistent across countries, due to a variety of reasons. For starters, you only have so many characters available to work with — which means, say, “Australia” isn’t going to work in full for most companies. Then there are the squatters who beat you to your name of choice. Finally, it’s hard to change a name once it gets a fair number of followers. Since so many local offices have created Twitter feeds on their own, many corporate communications people are discovering that consistency in naming across countries in next to impossible. If you’re interested in how companies have named their Twitter feeds across markets, check out Twittering in Tongues.